This website is best viewed with any webbrowser that supports HTML 4.01 and CSS. Screen resolution 800x600 and up. 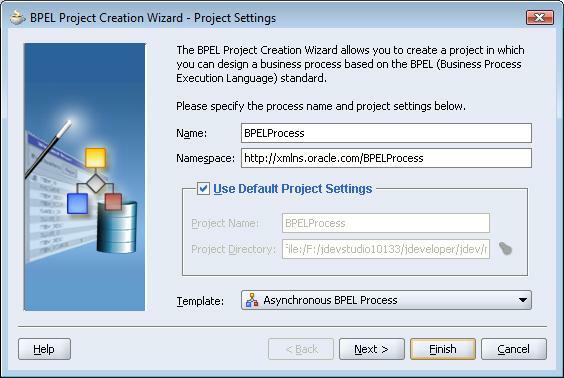 Oracle BPEL JDeveloper and MySQL database? How to get Oracle JDeveloper working with a MySQL database? First you need Oracle JDeveloper version 10.1.3.3 or up (because previous versions contain some bugs and therefor it will not work). You can download the latest version from the oracle website. Next thing you need is the MySQL jdbc driver: mysql-connector-java-5.1.5.tar.gz. This driver can be downloaded from the MySQL developer website. Start JDeveloper and create a new asynchronous BPEL process.